Don’t let the domain name throw you off… Delila Harvey conducts her business online at girlygolfer.com, but the products she makes are great for man, woman, boy, and girl! I recently had the pleasure of working with Delila on some headcovers, a valuables pouch, and some alignment stick covers, and though this is filed under “Review” I’m going to do something a bit unusual and share my opinion or review right up front, then talk about the process whereby these items came to be. If you’re in the market for anything custom-made – putter, driver, or fairway/hybrid headcovers, valuables pouches (she calls them “caddy bags”), alignment stick covers, or other leather golf accessories, you won’t go wrong availing yourself of Delila’s services. In about two months, you’ll have a product that pleases you in every way, with finely crafted materials and attention to detail in craftsmanship and design. 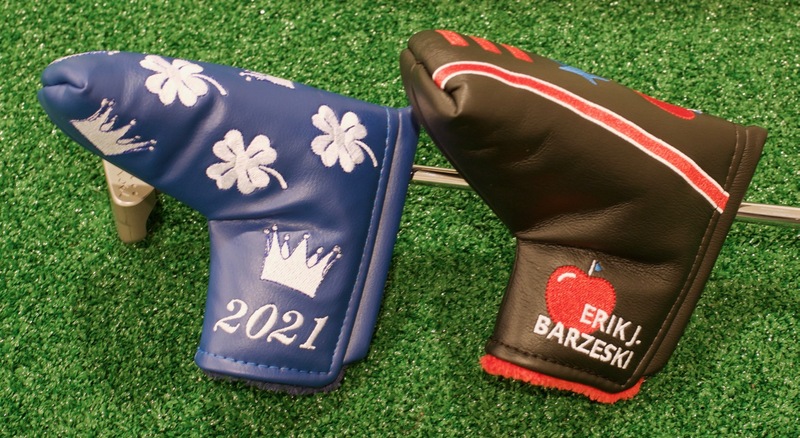 If you’re getting a custom headcover, caddy bag, etc., you’ll probably want a little design, a personalized touch, and the colors and style that you want. Delila gives you two options: design your own or let her design something for you. For my project, I wanted to get two headcovers designed for two putters. One, my daughter’s, was for a blade-style putter and I would design the headcover myself. For the second, I gave Delila some basic instructions, a few pieces of clip art, and let her come up with the overall design. 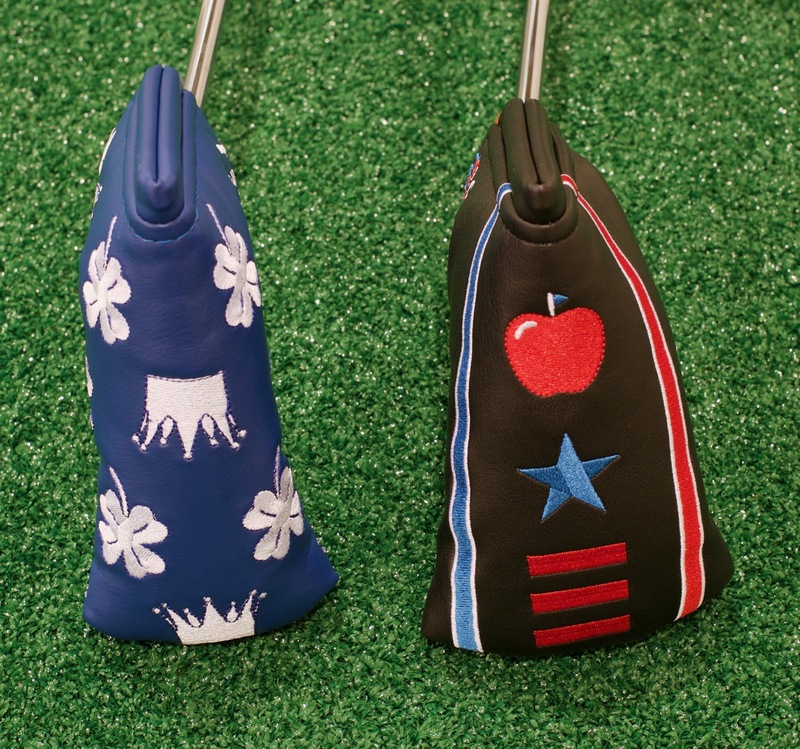 Normally, to order a head cover, a customer would make a small down-payment or a sort of “design fee” to cover the creation of the design and to reserve your spot in the (manual) production line, then pay the final fee before the headcovers ship to you. In the interest of disclosure, I paid a slightly reduced rate for these headcovers (and the full normal rate for everything else I’ve ordered from Delila since) with the understanding that I would write an honest review. My daughter Natalie is going to be a freshman golfer next year, and her school colors are blue and white. She won the Erie Girls Match Play last year, and the morning of the final match, she swapped out her ball marker for one with a crown on it. Previously she’d been using a four-leaf clover ball marker. She swapped out for the crown because, in her words, “she knew she was going to win.” Yeah, she’s a smug little gal. 🙂 Both symbols, though, she considers lucky. So I modified the crown I’d designed for Lowest Score Wins (I’d made a crown for “GIR is King!”), and whipped up a modified four-leaf clover. I downloaded the template for a blade putter (a simple PDF file) and imported it into Adobe Illustrator. If you have the accompanying artwork in a high enough resolution, you can use just about any graphics program to mock up your design. My design as exported from Adobe Illustrator, with vector artwork used throughout. 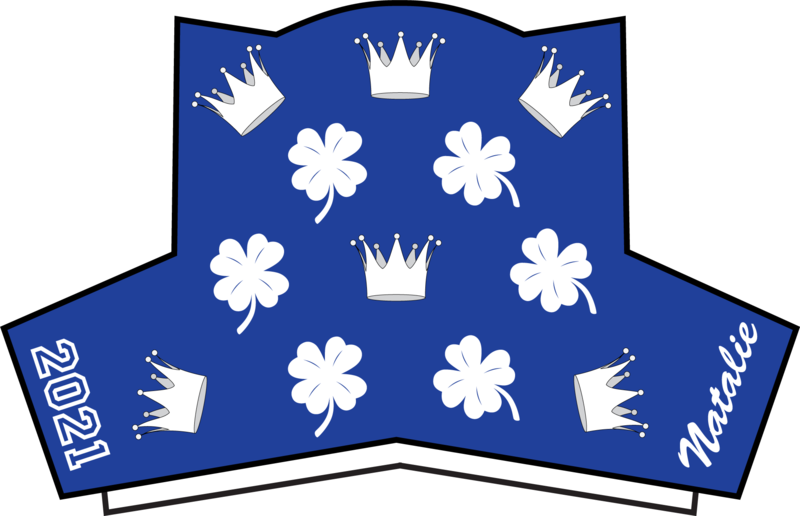 I sent this file along with the Illustrator vector files for the crown and the four-leaf clover off to Delila with the comment that I’d like something like this. The “2021” is her graduation year from high school, “Natalie” was in a hand-written style font, and the colors and graphics matched what she would like. After a short delay, Delila responded with this mockup (she processes everything through her stitching software to make sure that the design is even possible). Delila’s first “stitch-out” of my design. 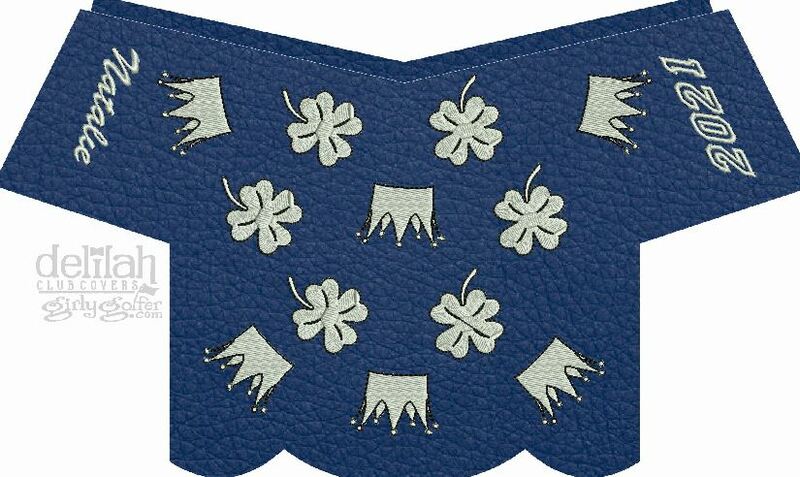 I responded to indicate that I didn’t love the “collegiate” font italicized on the “2021.” I asked about the line that appeared to be going through the middle of at least one of the clovers (it’s just a byproduct of the stitching program and would not exist in the final head cover). 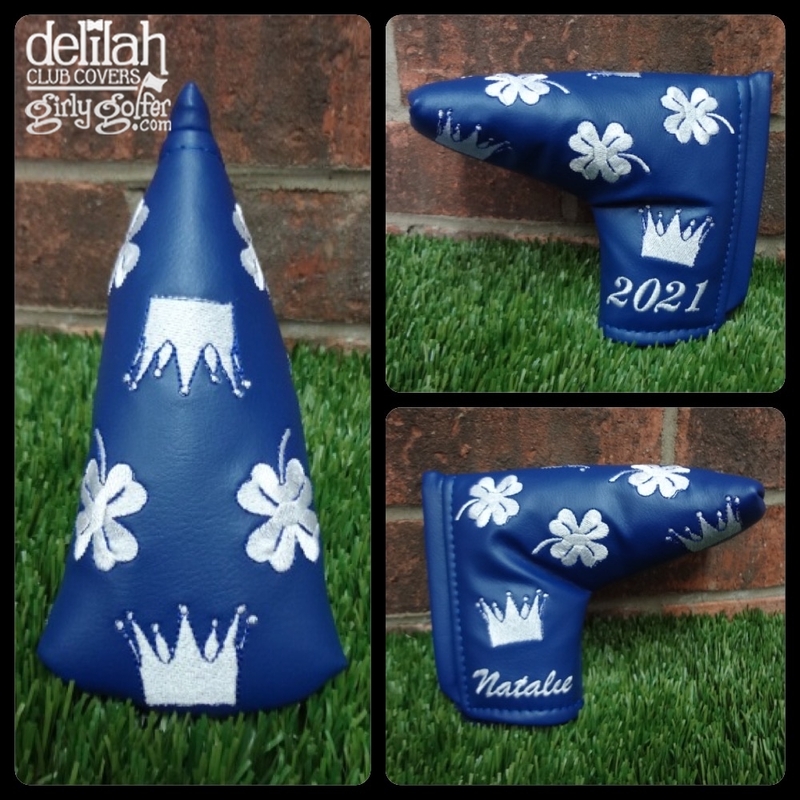 Delila’s second, much-improved, and final stitch-out rendering of Natalie’s putter cover. She changed the font on the “2021” to be more of the scripted style, which I liked, and also rotated the clovers and crowns (compare them to the image above) in a way that makes so much more sense than my design. Good catch! 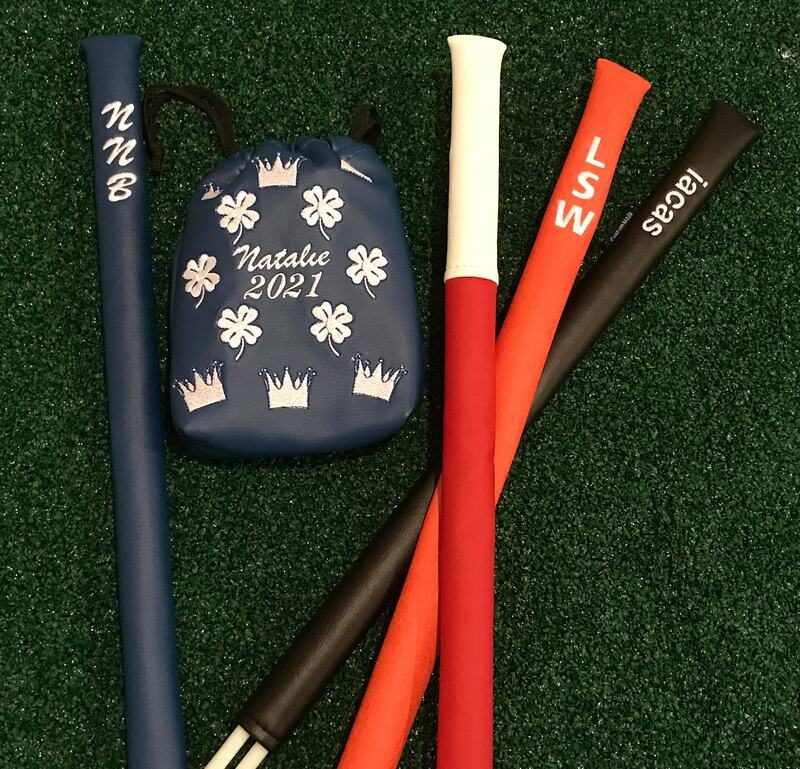 I gave the final “OK” and Natalie’s headcover went into production. For my headcover, I wasn’t sure what I wanted done. I could have had a Penguins/Steelers/Pirates themed head cover, but that wouldn’t have matched anything. 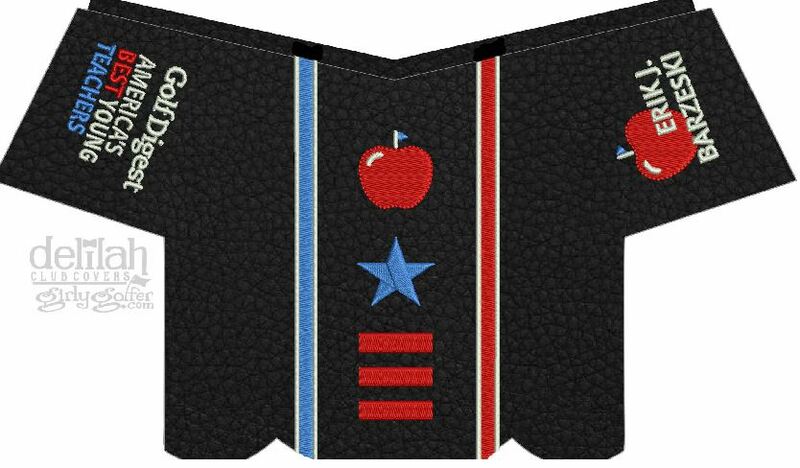 I’m involved in Lowest Score Wins®, Golf Evolution®, 5 Simple Keys®, Analyzr™, and of course The Sand Trap.com, but couldn’t imagine a head cover that incorporated all of that on a single design. 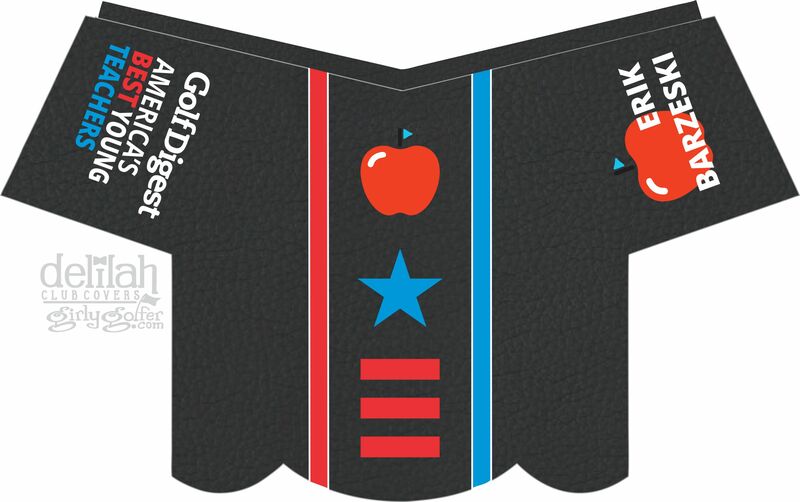 I finally settled on the idea of celebrating my selection as one of Golf Digest’s Best Young Teachers, and sent along some artwork – the apple with a flagstick, the main logo, and the colors – to Delila. I told her a black headcover with these elements would be great and looked forward to her design. Delila’s first stab at a design for my putter cover. I only asked for one small change. I asked for my middle initial to be added to the name, and confirmed that the color of the fur inside should be red and would pretty closely match the red in the design, and got the stitch graphic back later (I’m not sure why the red and blue stripes switched positions – it may have been an editorial choice Delila made – but it looks good either way). With the “J.” added to my name, I gave the “OK” for this head cover to be made into a physical item. I gave the “OK” and both headcovers entered production. Delila’s product shots before she shipped them out. Click for a larger version of each. Both headcovers were packaged up and mailed out via Priority Mail so I had them 2-3 mailing days later (Delila ships from Illinois). I said before that the products that arrived were great, and everything I’d hoped they’d be, and they are. But what does that mean, exactly? Both headcovers are made from a leather-like material (100% PVC-free polyurethane) that feels rich, supple, soft, and leathery. It lacks the unique grain patterns or features of authentic leather and is clearly a manufactured material, but it’s miles beyond the vinyl or other leather substitutes we used to have. It’s soft and pliable, and feels as though it will retain its suppleness much longer than actual leather would. Delila offers nearly 30 colors of “leather” including 11 premium colors. The inside of each headcover is filled with a soft faux fur that feels just perfect. It’s available in over 20 colors and is just about the perfect length and feel; the inside of the putter feels like your favorite stuffed animal ever. 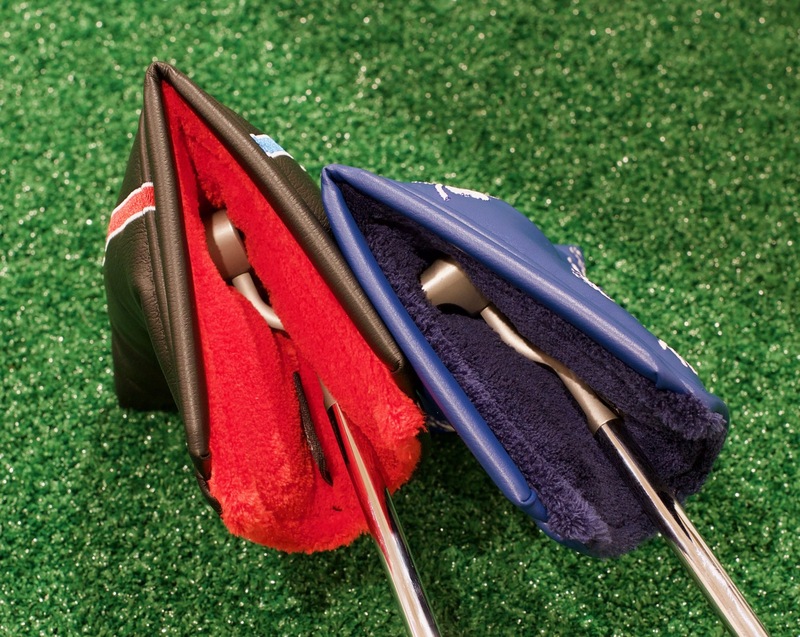 The magnetic enclosure travels the full length of the opening to the putter cover and is a series of magnets to allow for easier opening and closing. I expressed my concern about the “hinge” of the magnetic enclosure, and whether that would wear through within a few years, but Delila says she’s never had a customer show her this and having used the putter cover now for several months, I can see how my fears were unfounded: the hinge area appears to be in as good a shape as on day one. The magnetic enclosure, being bound inside leather, will also not rip or wear through the fur fabric, which is a problem I’ve had on other putter covers. Finally, the stitching… it’s great. 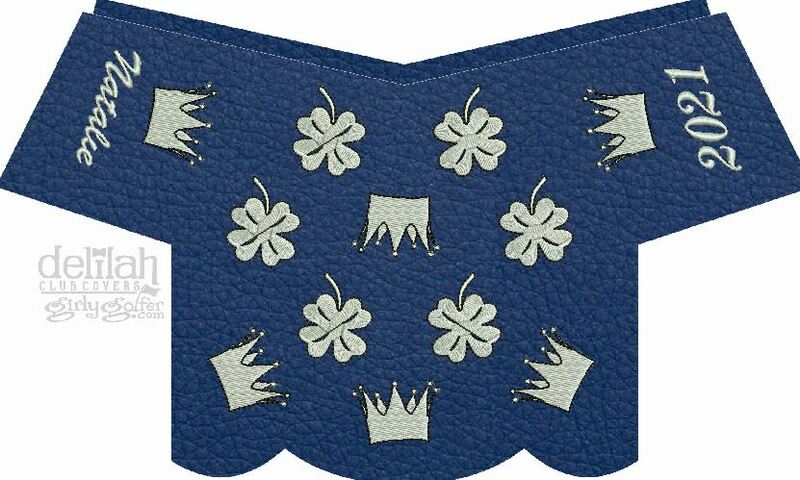 I was concerned, for example, about whether the little “balls” on the crown points or the stems of the clovers would work, or whether the letters on mine would appear, but again my fears were unfounded: the stitchwork is precise, small, and uniform. It’s tight enough to conceal all of the fabric beneath and offers up gorgeous text and imagery. 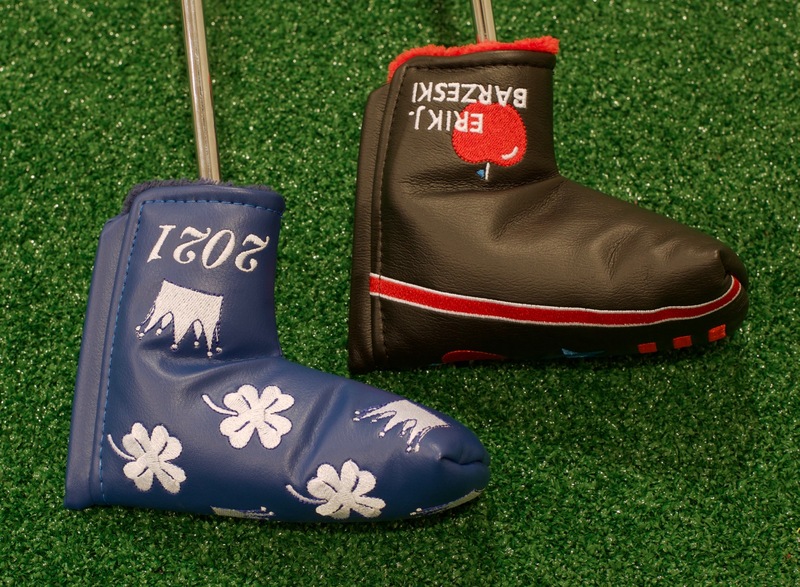 The non-customized stitching is similar: the headcovers are made to last. Seams are hidden, the stitching is even, and the overall product feels professionally made in every way. I mentioned that I had purchased some other things from Delila, and I can think of no other conclusion than to share an image of those. 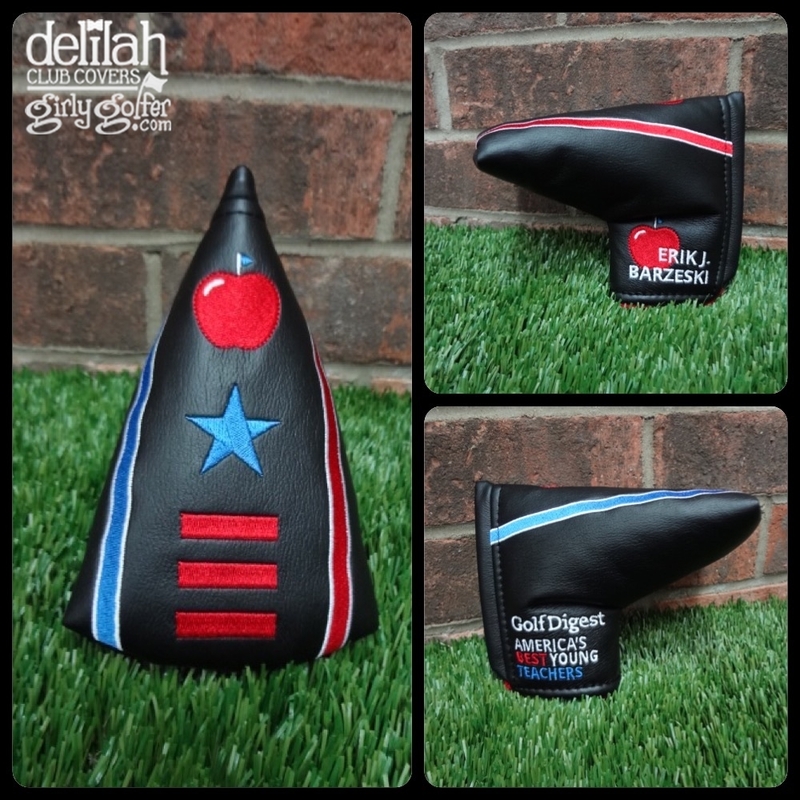 I was so happy with Delila’s work on the putter covers that I ordered more. The other accessories I’ve since purchased from Delila: a caddy bag and four alignment stick covers. So obviously, Delila can make more than putter covers, but if you want to see some customer photos, there are galleries for wood covers, mallet putter covers, towels, tee bags and caddy bags/valuables pouches, as well as a general gallery with a bunch of happy customers showing off their goodies. 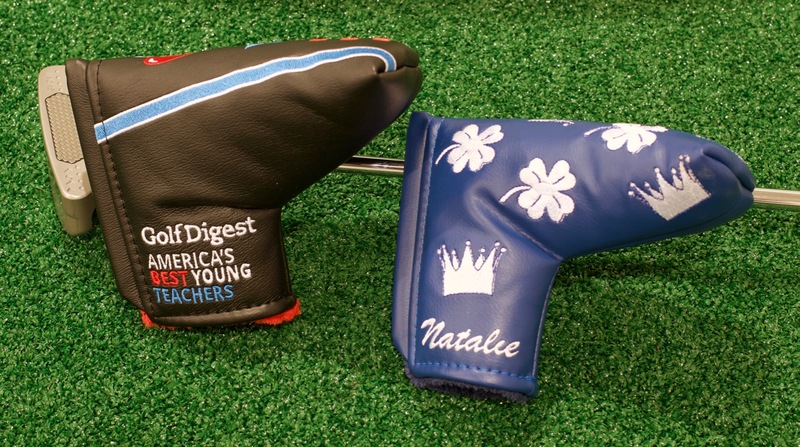 If you’re in the market for a beautiful, hand-crafted, professionally made custom headcover, caddy bag, or even alignment stick cover, click on over to Delila’s site and look at what’s available, and get creative. You’ll love what you get in the end. P.S. If you do get something from Delila, check out this topic in the forum and share photos of your goodies. 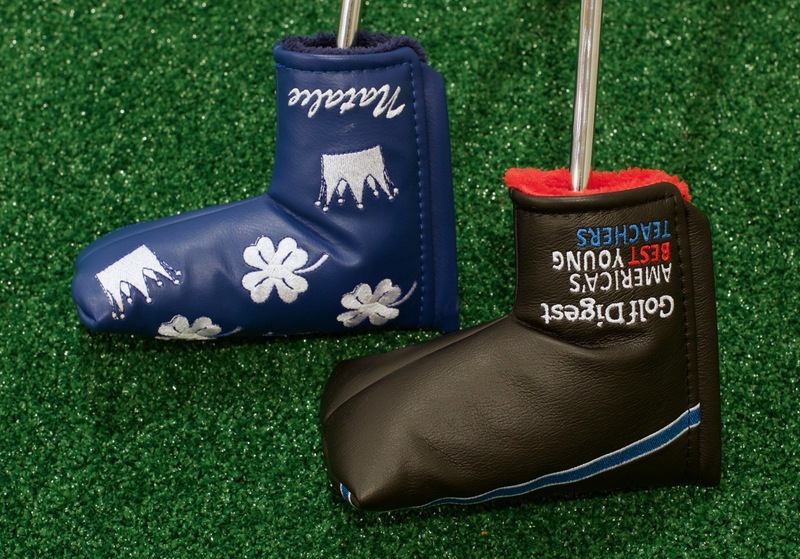 Here are a few photos of the final putter covers. Click on each image for a larger version if you’d like. Natalie has a thinner blade putter, while mine is a bit more of a rounded mallet shape. The detailed stitchwork came out phenomenally well. The “hinge” at the junction of the magnets will hold up for years and years. The magnetic enclosure and inner fur lining feel and function great. Any “TST” covers in the future Erik? I would like a driver and FW wood cover. Wow these look great! Soon as I can figure out a design and what I’d like I am going to contact Delila to get what I want. So great. One question. Do you pay up front, and is the cost the same all the time? Steve, I’ll let Delila say a bit more. 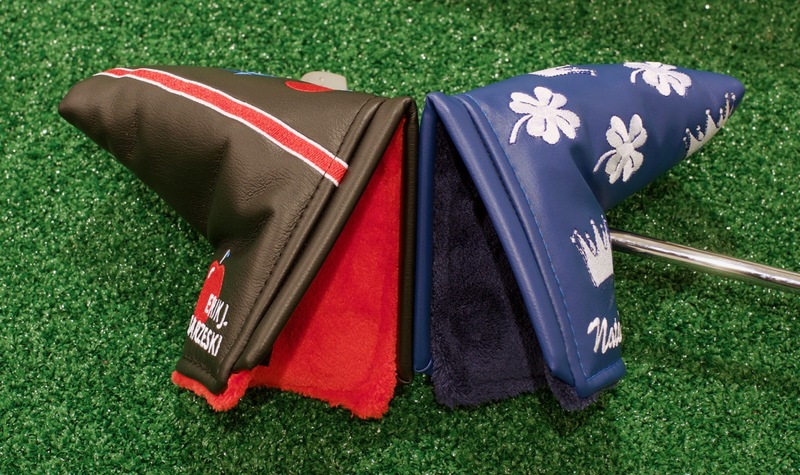 My best recollection is that all the putter covers are about the same, unless you get some higher end leather or something perhaps or a really intricate design, and you pay $25 as a design fee, and then the balance (about $45 for a $70 total, IIRC?) when the head cover is ready to be made and shipped to you. Since each cover made is totally unique I won’t know the cost of cover until I digitize design into embroidery format. The average cost is about $70. However, I’ve had some that were $50 and a few that were over $100. It’s basically up to you! The larger/more detailed your design is, the more it will cost. You’ll pay $25, when order is placed. Then as soon as your order comes up in the queue, I’ll create your design proof and email it to you. Along with the cost, minus your $25 deposit. You may ask for edits or approve. Once approved, I’ll send invoice for the balance. We’ll usually have cover ready to ship within a week after balance is paid. It does take a while for your order to come up in the queue, currently 10-12 weeks. Therefore, even if you don’t know exactly what you want you may fill out the order form and just note that you’ll provide details of your design at a later time. I’m looking forward to creating for you! I used Delilah about 2 years ago for custom mallet and blade/small mallet covers. They turned out just as I wanted. She has a great reputation among golf forums and is in demand. The closure is magnetic, which I like, and her cover even gives the large mallet great protection. Highly recommended.